That Extra Dimension is an annual invitational exhibition featuring sculptural works by artists from throughout Central California. The exhibition serves as a well-rounded survey of the quality and diversity of work being made by sculptors from throughout California’s San Joaquin Valley and the surrounding region. 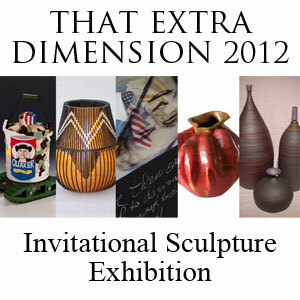 That Extra Dimension 2012 will be on display at Arts Visalia beginning September 5 through September 29 with an opening reception to be held Friday evening, September 7, from 6 to 8pm. For the fourth consecutive year, the exhibition is being held in conjunction with the Visalia Arts Consortium’s Taste the Arts Festival, to be held in downtown Visalia, California, September 27th through September 29th.